Do you fancy trying the Prudential London/Surrey 100-mile bike ride in 2018? It’s a fantastic experience and we have the chance to book a guaranteed place with the charity I rode for this year The Caring Cancer Trust. They have 20 places and you can grab one if you book soon, we already have 11 of these places reserved in the first couple of weeks. Unlike a lot of charities, they aren’t too demanding, they have a registration fee of £25 and will be pleased if you can raise anything over £200 – I managed £500 for them this year. 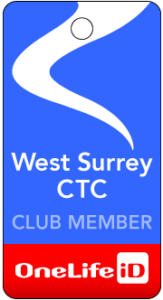 The charity was so pleased with what I did they have asked me to co-ordinate their Prudential for 2018 hence first dibs to West Surrey CTC riders! This charity’s purpose is to send children in remission from cancer on adventure holidays with any excess money being used for ethical cancer research (caringcancertrust.com). This is a small charity based on the Isle of Wight, they have no paid employees just dedicated volunteers and all their income comes from the one shop they run in Ryde and donations. All the money they raise is used for their work with children, no big salaries are paid and they don’t have opulent offices to support. They don’t supply cycling tops or provide teams on the course cheering you on or provide a party or massage in Green Park but they are very supportive and very easy to deal with. , I will be away on holiday in Canada from 3rd to 18th September. Yes please – entered the ballet many times but never got a place. More than happy to support Caring Cancer Trust.